Centerpieces show the uniqueness of the couple. But centerpieces can be expensive, especially since you need one for every table. 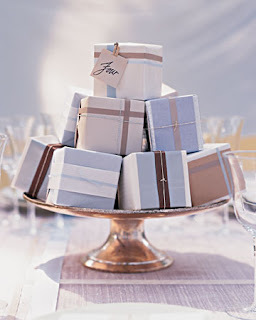 Favors can also be costly since you need one for every person that attends your reception. So, why not combine the two and save some money? 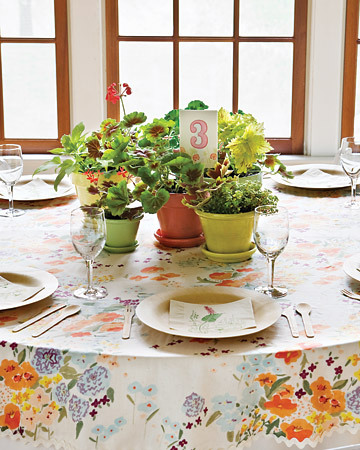 Here are a few ideas on how to make your favor your centerpiece! 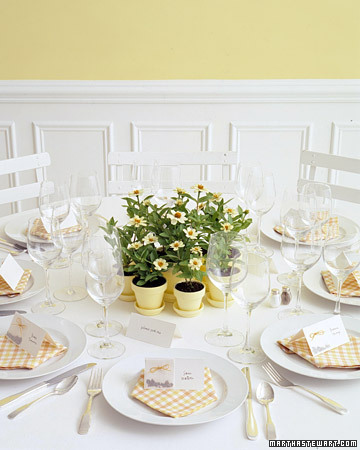 A cluster of potted zinnias adds charm to the table at a country or casual wedding. A sign next to the display asks guests to "Please pick one." The pots are painted with acrylic paint to match the flowers. The theme that inspires the favor continues at each place setting: Seeds packaged in glassine bags are attached to each of the tented place cards with yellow twine that is inserted through two small punched holes, then tied in a bow. Directions for planting are printed inside the cards. 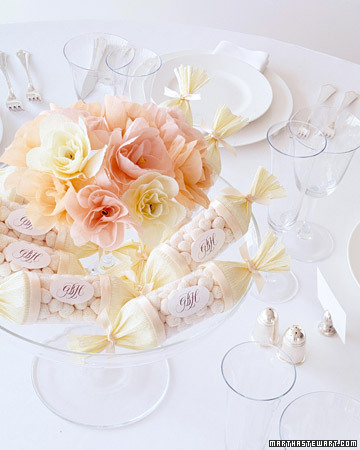 Humble supplies can take on an elegant air: Monogrammed stickers and crepe paper decorate clear plastic tubes filled with champagne-bubble candies. They're then piled into a glass compote around a smaller compote of crepe-paper flowers. 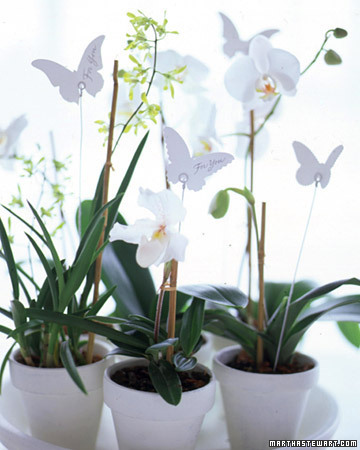 As a centerpiece for the party and favors for the guests (perhaps at a shower), orchids are presented in terra-cotta pots painted white and arranged on a saucer; a butterfly-shaped tag on a thin wire holder hovers over each plant. This display is a centerpiece, a stack of party favors, and a table-number indicator all in one. Fill small cardboard boxes with cookies or candies, wrap them with bands of paper and slender ribbon, and stack them on a silver compote in the shape of a pyramid. Attach a table number to the topmost box. With their beautiful ornamentation and lettering, biscuit and tea tins bring old-fashioned charm to a reception table. New or vintage, the containers are inexpensive and easy to find at specialty-food stores, tag sales, and online auctions. 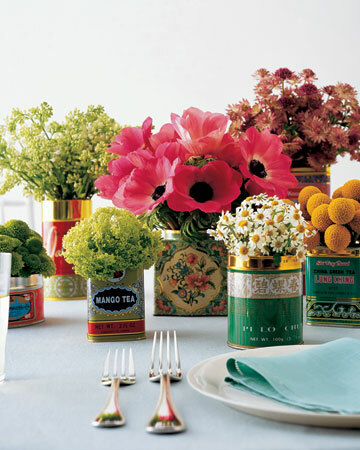 Test tins to make sure they're watertight before filling with single-flower arrangements. If any do leak, use plastic bags as liners. 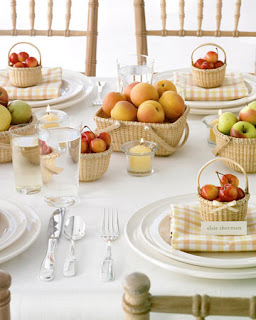 Baskets brimming with fruit imbue a reception with rustic charm. We filled Nantucket baskets in various sizes with warm-toned fruits: pears, apricots, and two kinds of apples. Small baskets laden with blond cherries are arranged at place settings for guests to take home; tiny bows are a graceful touch. Thank you to Martha Stewart for these great ideas! 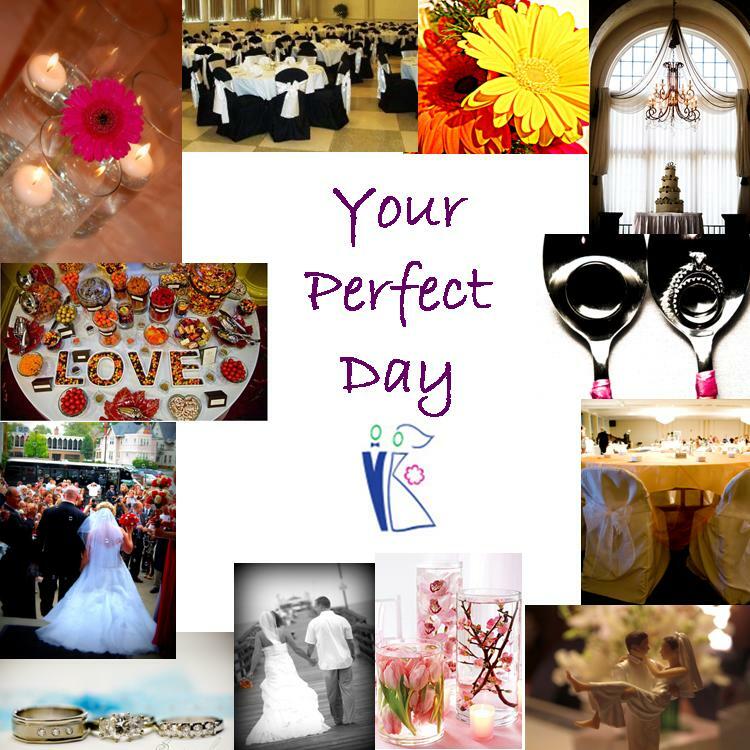 Your Perfect Day...because you deserve it!